Apex beat will give idea about enlargement of cardiac chambers and activity of myocardium. 5. Locate the thrust by counting the ribs and measure how far it is from midclavicular line. 6. If the apex beat is not palpated in dorsal decubitus posture. Make the patient sit and lean forward and try. 7. If not palpated in sitting also look for apical thrust on right side of chest – to rule out dextrocardia. 8. If then not palpable comment as could not be localised properly. You should not localise the apex beat in the left lateral position because there is shift of apex beat to the left side for about 1-2cm in the left lateral position. Normal apex beat is in the left 5th intercostal space half inch medial to midclavicular line. Apex beat may not be palpable due to following reasons. 1. Normal apex beat :It is in the left 5th intercostal ½ inch medial to left midclavicular line, a brief tap confined to an area of 2- 3 cm diameter. Not much forceful. 2. Hyperdynamic : Apex beat means forceful and ill sustained impulse occur due to diastolic overload of left ventricle, occur in mitral regurgitation, aortic regurgitation, ventricular septal defect and patent ductus arteriosus. There is no obstruction of blood flow from let ventricle. 3. Heaving apex beat : Here it is forceful and well sustained occur due to systolic overload of ventricle. Apex beat is well sustained due to obstruction of left ventricular outflow. Examples are aortic stenosis, systemic hypertension, coarctation of aorta, obstructive cardiomyopathy. 4. 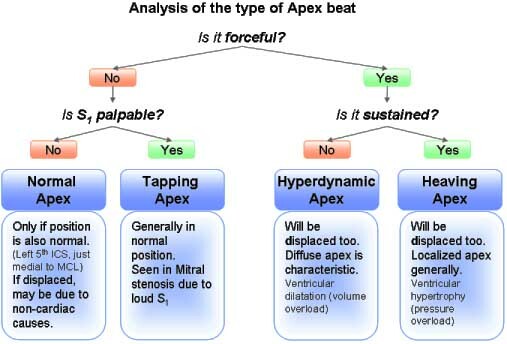 Tapping apex : Apex beat is of low amplitude and it is ill sustained occur in mitral stenosis and tachycardia. 5. Hypokinetic apex beat : Thrust of apex beat is minimal. Occur in myocardial infarction, pericardial effusion, constrictive pericarditis, myxoedema shock.